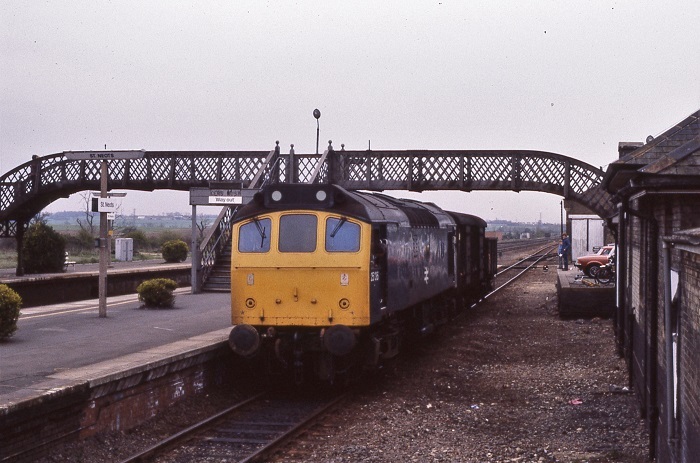 Photograph collection of webmaster 25136 at St Neots on April 22nd 1981. This would most likely be the local freight from Peterborough that visited St Neots, Biggleswade & Sandy. It would be operated by a Peterborough based crew, a Class 31 would have been more normal power for this working. The almost nineteen year career of D5286/25136 was spent allocated to a variety of London Midland Region depots. Time between last Classified repair and withdrawal: 60 months. Time between withdrawal and scrapping: 41 months. June 1965 to London Midland Midland Lines (LMML). May 1968 to Carlisle (12A). June 1968 to Preston Division (D10). January 1970 to Liverpool Division (D08). March 1973 to Nottingham Division (D16). 25136 was the 180th Class 25 withdrawn, one of five withdrawn during March 1983. After withdrawal 25136 was stored at Crewe until March 29th 1984 when it moved with 25132/135/143 to Gloucester and reached Swindon Works on April 2nd 1984, and broken up by the end of middle of September 1986. The cabs were transported to Vic Berry, Leicester for disposal. Noted Derby Works February 1967. Noted Derby Works June 1970. Noted Derby Works February & March 1978. Noted Derby Works August 1981 (N6 repairs). Noted Derby Works March 1982 (N4 repairs). Photograph courtesy Tom Sutch On July 13th 1971 near Norton Crossing south of Warrington several engineering trains await their call to the site of this day's activities. In this view 5286 waits for the call to move on this warm summers day. 5286 still carries its exhaust port in 'as-built' condition & location. The first recorded passenger working for 5286/25136 took place on August 25th working with Class 24 No.5022 on the 09.20 Manchester Piccadilly - Yarmouth to Lincoln Central, returning with the 09.15 ex-Yarmouth. The seaside resorts of Yarmouth & Skegness would feature prominently in the workings of 5286/25136. The only recorded passenger working during 1974 took place on September 28th with 25136 & 25001 working the 08.12 Derby - Yarmouth to Norwich and the return 14.56 ex-Yarmouth. The evening Huddersfield - Wakefield parcels was worked by 25136 on February 24th. On July 9th 25136 was noted at Basingstoke coming off the Reading line. 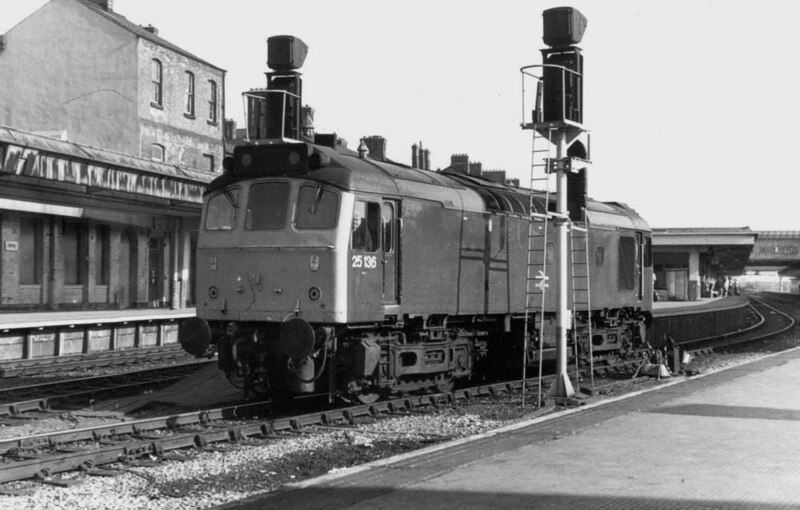 Three days later (12th) 25136 & 25258 worked the Walsall - Norwich (for Yarmouth) - Derby diagram. On August 9th the 11.58 Newcastle - Paignton was worked as far as Exeter St. Davids by 25136 & 25260 where they were replaced by 47055. Later that evening the 19.20 Exeter St. Davids - Basingstoke departed behind 25136, 25260 & 33032. The Class 25's are assumed to have come off no later than Salisbury, the purpose of this move is not certain. The following week 25136 was back on more normal duties, on August 16th, with 25020, they worked the Walsall - Norwich (for Yarmouth) - Derby diagram. On August 28th 25136 & 25129 worked the 13.35 Birmingham New Street - Newcastle. A Whitemoor - Shippea Hill ballast was worked by 25136 on April 7th. On May 29th the 08.52 Leicester - Skegness and the return 12.30 Skegness - Leicester were worked by 25136 & 25122. The Gunnie – Pennyffordd cement working still gave paired Class 25’s a good run under the WCML wires, August 16th found 25043 & 25136 in charge of the round trip working. On August 21st the 07.35 Nottingham - Llandudno Town and the return 13.05 Llandudno Town - Nottingham were hauled by 25136. The Walsall - Norwich - Yarmouth - Norwich - Derby diagram was worked by 25136 & 25207 on September 4th and 25136 & 25132 on September 18th. On May 5th the relief 10.05 Birmingham New Street - Yarmouth to Norwich and the return 14.45 Yarmouth - Walsall from Norwich were worked by 25136 & 25031. On July 16th the 08.10 Derby - Yarmouth was worked as far as Norwich by 25136 & 25218, they did not work the return diagram. A Banbury - Mistley freight on December 8th was worked by 25136. During February & March 25136 was under repair at Derby Works, on March 15th it went out on its Derby - Leicester test run, assisting 45110 on a London service. There were five visits to the seaside and two visits to Kings Cross for 25136 during 1978. On May 27th 25136 & 25129 worked the Walsall - Norwich (for Yarmouth) - Derby diagram. A week later on June 3rd 25136 & 25195 worked the 09.19 Manchester Piccadilly - Yarmouth to Lincoln Central, returning with the 09.15 ex-Yarmouth. 25136 was in rescue mode on June 8th when the 07.58 Peterborough - Kings Cross failed at Huntingdon behind 31201, the entourage was dragged to Kings Cross by 25136. On June 10th 25136 & 25127 worked the Walsall - Norwich (for Yarmouth) - Derby diagram, the next day the same pair went out on the 08.40 Leicester - Skegness and 18.30 return. 25136 was back at Skegness on July 7th with 25115 on a day excursion from Birmingham New Street. At lunchtime on August 8th 25123 & 25136 were noted northbound with a merry-go-round coal train at Kingsbury. Four days later on August 12th 25136 & 25129 worked the Derby - Norwich - Yarmouth - Norwich - Walsall diagram, but taking over on the outbound run from two Class 25's at Nottingham. The 13.02 Llandudno Town - Nottingham on August 19th was worked forward from Derby by 25136. The second trip involving Kings Cross occurred on October 26th when 25136 worked the 17.18 Kings Cross - Peterborough. On July 3rd 25136 & 25149 worked a Nuneaton - Scarborough excursion as far as Alfreton where they were failed, 20158 & 20088 provided assistance to? Photograph courtesy Graham Turner As all the through platforms at Derby were reversible train & light engine movements could be unpredictable. Seen here On July 14th 1979 at the south end of Platform 3 is 25136 heading southwards. The middle of July produced a six day period when 25136 was busy on the seaside workings. The six days started out on July 14th working the 07.30 Nottingham - Llandudno Town and 13.00 return. Then followed five days (15th - 19th) of working the roundtrip Leicester - Skegness with 25164 (15th/16th/18th/19th), on July 17th they worked the Derby - Skegness outwards and came back with the Skegness - Leicester, a total of just over 900 miles for these five days. A month later on August 18th 25136 & 25127 worked the Derby - Norwich - Yarmouth - Norwich - Walsall diagram. 1980 was another year of trips to Skegness and Norwich/Yarmouth. However a rescue job on March 1st saw the 05.54 Derby - Weymouth require assistance from Oxford (?) to Reading by 25136 & 25100 following the failure of 47234. On May 21st 25136 took steam locomotives 673, 4027 & 13809 and one coach from the Midland Railway Center, Butterley to Bold Colliery, via Chesterfield and the Hope Valley line, in order to attend the Rainhill festivities. At the end of May there were four days of passenger activity, on May 26th 25136 & 25125 worked a roundtrip (?) Leicester - Manchester Piccadilly day excursion. On May 27th - 29th 25136 & 25125 trips were made to Skegness, from Derby (27th & 28th) and Burton (29th). On June 7th 25136 & 25115 worked the Derby - Norwich - Yarmouth - Norwich - Walsall diagram. A month later on July 5th 25136 worked the 13.15 Birmingham New Street - Norwich and the 18.32 return, another 348 miles run up. The third week of August was busy for 25136. On August 16th 25136 & 25133 worked the Walsall - Norwich (for Yarmouth) - Derby diagram. The same pair of locomotives then followed up with three visits to Skegness, from Derby (19th) and Leicester (20th & 21st). The seaside was involved again on August 24th, this time with 25214 working a Rhyl - Hinckley day excursion (return leg only?). The passenger activities of 1979 & 1980 were not sustained for the following three years. Two workings occurred in 1981, on June 15th 25136 & 25275 worked the 08.25 Manchester Piccadilly - Cardiff forward from Birmingham New Street and returned with the 15.35 Cardiff - Manchester Piccadilly as far as Birmingham New Street. As the sun starts to set in the west on this chilly January 1982 afternoon another train of empties arrives behind 25136. 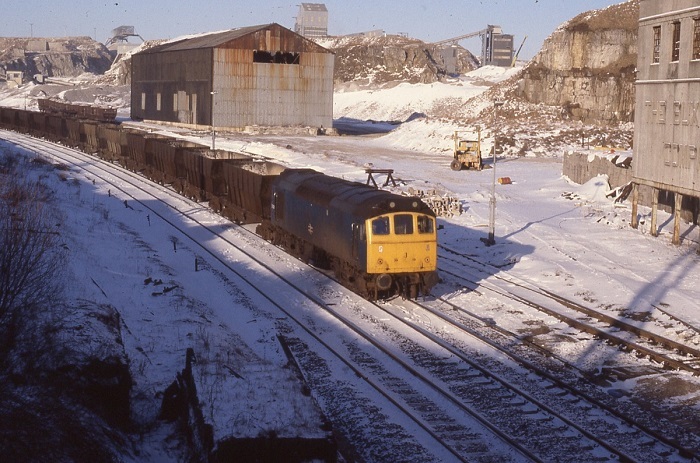 The train has just crested the 982' summit, and as can be seen snow was a frequent visitor to the north Derbyshire hills. 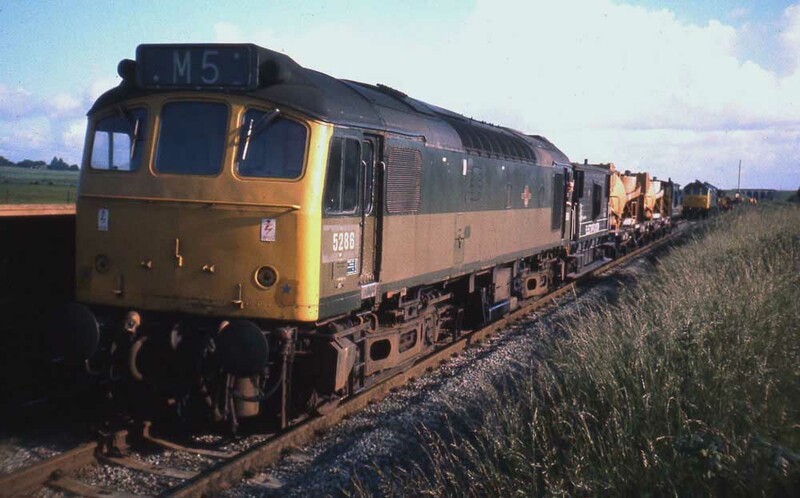 For some period during the ASLEF strike (July 4th - 18th) 25048 was stabled at Cardiff Canton. 1982 produced two days of passenger workings. On July 19th 25136 worked two Cardiff - Crewe roundtrips, another 556 miles run up. Two weeks later on July 31st 25136 & 25181 worked the 07.40 Euston - Aberystwyth forward from Wolverhampton, returning with the 14.00 Aberystwyth - Shrewsbury. The spectacular derailment of a Stanlow – Bishopbriggs oil tank train south of Acton Grange viaduct on March 3rd behind 47225 led to a major fire which closed the line for several days. On 5th, with the Chester line still closed a permanent way train was noted behind 25136 & 40022 at the scene. Like many others the last working for 25136 was a resue job. On February 12th the 09.03 Cambridge - Birmingham New Street failed at Nuneaton Midland Junction behind 25058. The train was dragged to Birmingham New Street by 25136. 25136 was withdrawn on March 28th 1983. Page added March 18th 2013.